Even though sugar is one of the main causes of expanding waistlines and increased dental cavities, it remains one of the most common ingredients in processed food. Even “diet food” like protein bars and sports and “nutrition” drinks can contain more added sugar than the daily allotment suggested by the American Heart Association, which is 37.5 grams for men and 25 grams for women. In the fast-paced, convenience-driven lifestyle of most Americans, we simply do not have the time to research the healthiest products. Thankfully, making informed choices will become much easier in 2018 with an update to the nutrition facts label we have been familiar with for the last 20 years. According to scientific data and the 2015 to 2020 Dietary Guidelines released by the government, consuming more than 10 percent of your total daily calories from added sugar makes it difficult to properly nourish your body while staying within calorie limits. Consuming too much sugar can also lead to chronic inflammation, which can cause weight gain and eventual diabetes, heart attack, stroke, or heart disease. Most consumers are aware of the substantial amount of added sugar in products like soft drinks, alcoholic beverages, and sweets, but they are surprised to discover how much sugar is hidden in products like salad dressings, pasta sauces, jam, and flavored water. The average American easily exceeds the “recommended” amount of sugar on a daily basis by consuming about 13 percent of daily calories from added sugar in sources like these. With the addition of the “Added Sugars” line to the nutrition facts label, the hope is that consumers will become more aware of their sugar intake and portion sizes so they can make more informed decisions. 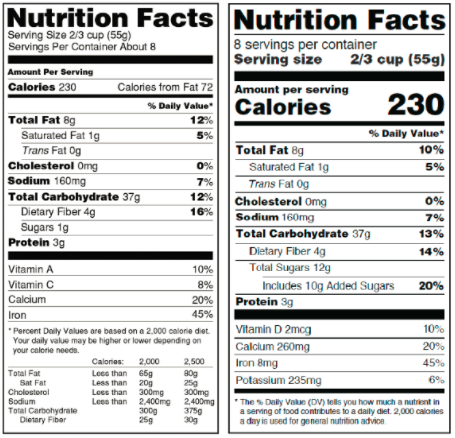 Other updates will be made to the nutrition facts label and are based on scientific data, the latest nutrition and public health research, and dietary recommendations from authoritative sources such as the American Heart Association, the American Academy of Pediatrics, the Institute of Medicine, and the World Health Organization. For the best oral and general health, consumers should also monitor their intake of carbohydrates, which convert to sugar in the body and can have the same negative effects of sugar over time. To further maintain your oral health and the overall beauty of your smile, schedule an appointment with Dr. Kevin Sands. Please call (310) 273-0111 or fill out our online contact form today for more information. This entry was posted on Tuesday, December 6th, 2016 at 5:07 pm	and is filed under Dental News, Nutrition Labels, Oral Health. You can follow any responses to this entry through the RSS 2.0 feed. Both comments and pings are currently closed.